On this Mother’s Day weekend, the thoughts of The Legal Genealogist flow backwards to all those women in the direct maternal line. 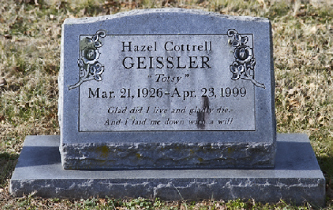 Hazel Irene (Cottrell) Geissler was born in Midland, Texas, on March 21. The year was a bit of an issue for her. As a kid she’d always wanted to be older, and so she claimed 1925. Except that, when she applied for Social Security at what she said was age 62, the government produced school and other records showing she’d really been born in 1926. She’d always insisted that she wanted to be cremated when she died, and as her children we intended to honor her wishes. But her brothers and sisters were aghast. They wanted a burial, “like everyone else.” So we compromised and buried her ashes. Another compromise, and we went with the stone you see here. It was easier with my grandmother’s stone. Opal (Robertson) Cottrell was born on August 21, 1898, in Eagle Lake, Texas, the oldest of the four children of Jasper and Eula (Baird) Livingston Robertson. She moved with her family to the Indian Territory around the turn of the century, and grew up there with the new State of Oklahoma. 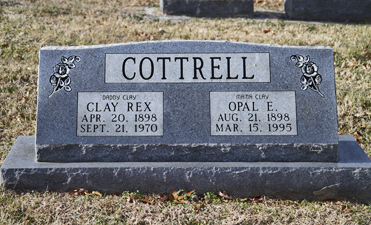 She married my grandfather Clay Rex Cottrell in Texas in 1916, bore her first two children in Oklahoma, but then returned to Texas to live and bear another 10 children. She raised 10 of those children to adulthood, losing the first-born Ruth as an infant in 1918 and son Donald in 1932 to smallpox. In 1950, she and my grandfather and their youngest children moved to Virginia where they lived on a farm owned by their oldest son, my Uncle Billy. Opal, called “Mama Clay” by generations of descendants, outlived my grandfather by nearly a quarter-century, so it was simply a matter of adding her details to the stone placed for him all those years earlier. There were some compromises when her mother, Eula (Baird) Livingston Robertson, died at the farm in Virginia in 1954. The big question was where to bury her: there in Virginia, or back in Oklahoma with the husband she had lost so many years earlier. Jasper Robertson was not quite 41 when he died in 1912, and he was buried at the Frederick Cemetery in Frederick, Oklahoma. Eula had gone on to raise their four children there in Oklahoma, and was only persuaded to come east and join her daughter in the last years of her life. Practicality won out on this one: shipping a body from Virginia to Oklahoma was prohibitively expensive for the family in 1954. So Eula lies next to her son-in-law, her daughter, and, now, many of her grandchildren. 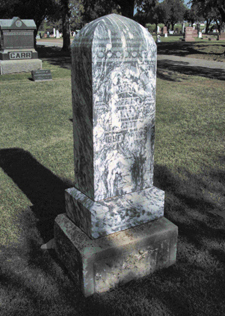 Eula’s mother, Martha Louise (Shew) Baird Livingston, was buried in the Frederick Cemetery in Frederick, Oklahoma, close to where Eula’s own husband lies. She was born in Alabama not long before the Civil War, lost her father as a young child, and married twice — or at least had children by two men (we’re not entirely sure about the legal status of the first relationship that resulted in Eula). She bore nine children in all, Eula being the oldest and only child of Jasper Baird, and the other eight being the children of Abigah Livingston. The family moved first to Texas in the late 1880s, and then to Oklahoma. Her year of birth isn’t entirely clear — her stone which was fading even years ago when I photographed it appears to say she was born in 1859; the 1860 census says she was six years old then (or born around 1854); the 1870 census says she was 17 (or born around 1853); the 1880 census says she was 25 (or born around 1855); and the 1900 census says she was born in February 1855. But even if you take the earliest birth year, it’s clear that she was only in her mid-50s when she was lost to tuberculosis in 1909. She died in New Mexico where her family had sent her for treatment — and the body was brought back to Oklahoma for burial. I would love to go a generation further back — to Margaret (Battles) Shew, Martha Louise’s mother. Born to a father who ran off from his first wife to live with (and ultimately marry) Margaret’s mother, she married Daniel Shew in the late 1840s and had borne one child by the 1850 census. She was a widow with three children under the age of 10 by 1860, facing the task of raising them to adulthood as the war clouds drew near. We know she succeeded — she’s recorded with Martha Louise and Eula in 1870 and again with Martha Louise and Abigah Livingston in 1880. But that’s where the records and even undocumented family lore run out. 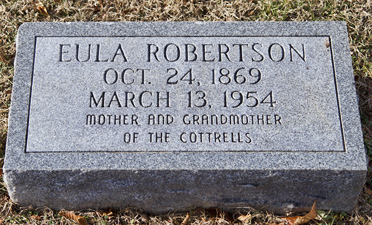 She was wasn’t with the Livingstons in Texas in 1900, but there’s no record of her death or burial in Cherokee County, Alabama, where they’d all lived before moving to Texas. We simply don’t know if she died in Alabama, and was buried there, or if she traveled with them to Texas and was buried there. So we know for sure where only four generations of women lie… and we celebrate them, their lives and their stories this Mother’s Day weekend. If I could meet one ancestor, I would want it to be Sarah. I lucked out. I know where five generations of my maternal line are buried, the most recent three in the same plot, the next is a few plots over, and my great-great-great grandmother in the next town. Her mother, alas, is at least half a continent away and her grave is not yet found. Happy Mothers’ Day to all! Tombstones can be a tricky place for dates. And sometimes even for names. My grandfather was born in 1889, and died (tragically early) in 1929. His age at death is often given as 40, because people forget to account for the fact that his birthday was Dec 31. And then they adjust his birth year from 1889 to 1888 because they think he was 40 at death. His grave marker says 1888. Years after my grandfather’s death, my dynamic grandmother became ill suddenly in her 80s two states away, where she lived with her eldest daughter. The family congregated from all over, many of them arriving after her death, which occurred on a Saturday. She wanted to be buried next to her first husband. Two of her sons had driven about the 1000 miles from their home town, in a large 1960s oversize station wagon, which could easily accommodate my grandmother’s coffin. But they needed to leave right away to be back before the workweek started, and there wasn’t time to get the required transportation certificate, since it was the weekend. They loaded the coffin up anyway, and drove straight through to the cemetery, arriving late Sunday night. Man, I bet they were exhausted! I’m not sure who ordered the markers, which appear to have been installed at the same time. I suspect that the sons did, and as so often happens, gave what they thought was the correct information for their father. They had been young teens when their father died, so it is not surprising they were vague about his age and birthyear. For their mother, the form had space for only two surnames, and they put down her two married names, though one was meant for her birth surname. So her stone identifies her by the names of the men she married, but does not include her birth surname (though it does appear on her death records). This has played havoc with indexing ever since: often she is listed with her first husband’s surname in place of her own birth name. I have actually seen trees in which people have tried to attach her as daughter to her husband’s parents! Judy, once again I goofed- the message space is narrow for me. I meant to say my grandfather was born in 1889. Can you fix for me? Thanks.